Parallel coordinate maps uses high-dimensional geometry to analyze data being studied. The back has parallel lines drawn while the figures are shown in the front of the parallel lines. Each parallel line represents a certain factor and each line drawn in front is a different characteristic within the variable. 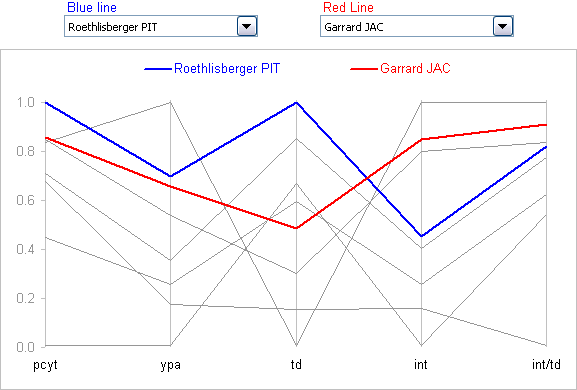 In this map, quarterbacks for different football teams are shown with the red line being Garrard and the blue line being Roethlisberger. Each quarterback has his statistics shown and compared on the same graph.